Some delicious kettle corn from Velma’s Wicked Delicious. Velma’s Wicked Delicious Kettle Corn has been popping at farmers’s markets and craft shows across throughout New England since 2006. Today, we speak with Eric Bickernicks, the owner of this kettle corn business to discuss how to start this type of business, what it’s like to be an operator, how much it will cost to start this type of business, and the equipment you’ll need to get up and running. Eric first got the idea to start a kettle corn business while visiting a fair near his home. He couldn’t believe the length of the line that was being formed next to a little kettle corn stand. After doing some mental math in his head about how much revenue this tiny business was generating at $5.00 in revenue per bag, Eric was hooked and decided to start a old fashioned kettle corn business of his own with a buddy. The rest as they say is history and Eric has continued to operate this business for the past decade! Pro Tip: If this is a business model you’re interested in diving deeper into, check out Eric’s website WickedDelicious.com. Eric has been documenting his journey operating a kettle corn business here for the past 10-years and provides summaries of many of the events that he’s vended at. It’s a great resource if you want to learn more about this topic! Watch the video above to see Eric Bickernicks in action at the Framingham Farmer’s Market to get a sense of what the typical day is like for a kettle corn vendor. This is a time lapsed video from a 5-hour vending time frame and condensed into a video that lasts under 2 minutes. After deciding to start the business, Eric and his partner decided they would take a chance and start vending at a local farmer’s market near their homes. The event charged a fee of roughly $50 to vend at so the risk was very low that they would lose money. At the end of the farmer’s market Velma’s Wicked Delicious Kettle Corn had generated about $200 in sales. Not an incredible amount of cash and not much more than “beer money” as Eric described it. But the concept had worked to generate revenue! From that initial day, sales continued to grow organically for the business. By the second season of operating, it was routine for the business to generate around $400.00 regularly per day in sales. At $5.00 per bag, you only need to sell 80 bags of kettle corn in a day to reach that number. Slowly, the business continued to grow overtime though word-of-mouth and repeat customers at farmer’s markets. For some customers, it became a routine to pick up a bag of Velma’s Wicked Delicious each week just like they would eggs or milk. This repeat business led to higher overall sales numbers over time. Eventually, the business would more frequently make $800 all the way up to $1,000 in a single day. When Eric opened Velma’s Wicked Delicious for the first time, no one knew about him or the quality of his kettle corn. So how did Eric convince folks to give his unique style of corn a try? The same way that thousands of new food businesses have used to raise awareness of their product. Free samples! In the early days, Eric used free samples to give craft show goers a taste of their product. Enough people that tried the product, liked it and became a customer. This can be a great way to encourage people to try your product for the first time. The next time they see you, they might just skip the free sample and buy a bag to bring home. $5.00 per bag gross profit. This equals about $3.50 in net profit per bag sold after expenses. There are some other variable costs that you will also need to consider, however. Some craft shows or fairs charge a small fee to be able to vend. It can cost anywhere between $25 – $300 depending on the type of event you plan to vend at. Make sure to build this into your expenses prior to attending an event. You should also factor in gas money for the travel required to attend each event. Kettle Corn Popper – The kettle corn machine is what you need to operate your business. Make sure you invest in something that is durable and allows you to produce a consistently high-quality product every time you vend. Sifting Bin – The bin is where your kettle corn will be stored temporarily before it is packaged. Stirrer – This is used to stir the kernels and make sure the product gets popped. It’s also good for entertainment purposes because customers can see watch you making their kettle corn. Counter – A counter is helpful for serving customers. It also provides a nice way to hide product. 3-Compartment Sink – This is needed in most areas to adhere to health regulations. Additionally it will allow you to wash your hands. Propane Tanks – This is to provide power the popper. Tent and Signage – The tent serves two purposes. One is to protect you as the vendor and product from the elements of wind, rain, and sunshine. The tent and banners that make up your pop-up also help to sell and draw attention to your stand. As an aside, one of the suppliers that Eric mentioned during our interview is North Bend Kettle Corn Equipment. This is the brand of equipment of Eric uses for his business. Another business recommended by Eric is Mann Made Poppin’ Machines. According to Eric, your biggest expense is going to be purchasing a kettle corn popper machine and a tent / pop-up. The costs of this equipment is variable, but a professional grade kettle will run you between $3,000 – $5,000 on average. Eric advises not going too cheap on this investment since you’ll want a machine that will operate efficiently for many years into the future and cook a consistent product for your customers. Bottom line, if you find a popper on Amazon.com for $199 that’s probably not what you want to build your business around. Craft fairs / Antique Festivals / Car Shows / Farmer’s Markets / Fire Works Shows – If you’re just starting out these are great opportunities to begin. Typically the event fees are low here and you’ll be able to vend for $50 or less. Eric recommends starting small at events like these for a few reasons. For one, small events are low risk to you as a business owner. With a low entry fee it won’t take long for you to cover the cost of vending. Your overhead can be even lower since you’ll likely be able to operate the stand on your own so no need to compensate an employee. Larger Fairs / Festivals – County fairs and large music festivals are the types of events that can generate a big pay day. Unfortunately, vending at big events like these come at a price. Many of the biggest event charge hefty fees for the opportunity to vend. The price tag varies but could easily be $200 – $1000 for a multi-day event. This literally eats into your profits. The other thing is that you’ll need extra help if you plan to vend here. You may need to employ 1 – 2 employees to take advantage of the demand at these events. If you need to pay two employees at even $10 per hour each that’s more out of your net profits. Depending on the event, hiring some part-time employees could totally be worth it. But it’s a factor to consider before moving forward. Charity events – The different between serving at charitable events versus a car show is that you will usually need to share a certain percentage of your sales with the charity. 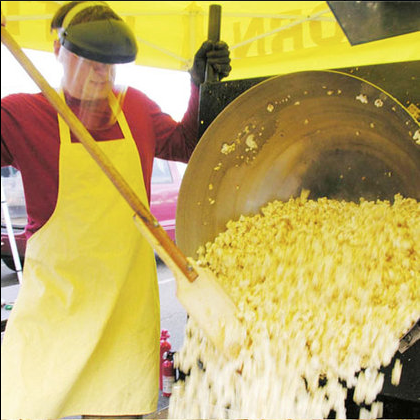 These events can be personally fulfilling as well as economically for a kettle corn business. There is one type of charitable event that Eric warns against, however. Churches will often do small fundraisers that attract 100 people or less. While it can be wonderful to help support every charity, you may not be able to afford to attend every event like this that you’ve been asked to participate in if you want to generate a decent income. Corporate events – These are the holy grail of the kettle corn business. Unlike other vending opportunities, you’re usually paid in advance with corporate events. This doesn’t just include vending at parties for businesses either. One of Eric’s favorite places to vend is at colleges and universities. Typically universities will buy a certain number of bags from you in advance. All you need to do from there is to show up and distribute your bags of kettle corn to the hungry crowd of kids. If the event isn’t well attended or there’s rain, it’s none of your concern. You have fulfilled your end of the bargain by attending the event and providing your product / service. The cops used to call us “kettle crack.” – Eric Bickernicks on the addictiveness of their product. It gets so hot because you literally have to stand over it [the kettle] and in August I’ve gotten very close to getting heat stroke. – Eric Bickernicks on working conditions you should expect on some of those hot summer days. I would have quit kettle corn years ago if I didn’t get one with the kettle motor and the stirrer on it. – Eric Bickernicks on recommended equipment for a kettle corn business. Typically you would do a craft festival. That is sort of the bread and butter of the kettle corn biz. – Eric Bickernicks on where you should start to look for vending opportunities. I get approached a lot of times when I’m sitting at the farmer’s market. People come to me and they’re like, “Will you do my event?” – Eric Bickernicks on the importance of being selective on where you choose to vend after your business is off the ground. It’s almost impossible to gauge how much you’ll be making unless you try it. – Eric Bickernicks on how the average income of a kettle corn business is highly variable depending on where you vend, how often you vend, and your overall work ethic.